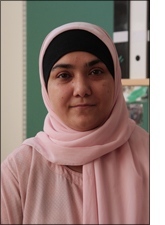 Den 23 september presenterade FD Alia Amir, Linköpings universitet, sin doktorsavhandling "Doing Language Policy: A Micro-Interactional Study of Policy Practices in English as a Foreign Language Classes". Doing Language Policy: A Micro-Interactional Study of Policy Practices in English as a Foreign Language Classes. This study investigates foreign language classroom talk and micro-level language policy-in-process from an ethnomethodological conversation analytic perspective. The study is based on 20 hours of video recordings from 20 lessons in an English as a Foreign Language classroom (EFL) in grades 8 and 9 of an international compulsory school in Sweden between the years 2007 and 2010. The main purpose of the study is to shed light on some of the distinguishing features of how a target-language-only policy is materialised in situ in a foreign language classroom. The study demonstrates the relative ease with which teachers and pupils uphold a strict language policy in the classroom, but also the considerable interactional work that is done, by both teachers and pupils, in cases where upholding the policy becomes problematic. An interactional phenomenon which arises in such cases is language policing, where the teacher or pupils restore the policy-prescribed linguistic order. Such sequences are analysed in detail. The study increases our understanding of how language policy is lived out in practice, through interaction in the classroom.